Day 38 | Galion-Alliance | captain-nicholls | Le Tour de U.S.
Woke a little later than usual as Granny's kitchen doesn't open until 7. We were there at 7 and had a good breakfast. 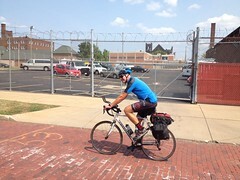 We left Galion and rode through a town called Mansfield. 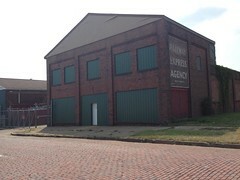 Trevor had mentioned that Shawshank Redemption was set in Mansfield. Instead of seeing that prison, we rode down the main street and we were treated to dozens of mansion style houses. Some were in disrepair and others had been completely restored. It was quite a treat. I was watching my map so I don't have any pictures :( As nice as Mansfield was it was very difficult to get out of. we wanted to get back on the 30 but the ramp leading to it goes onto the interstate first and no bicycles are allowed on the interstate. we opted for the bike route suggested by Google and after we had started on it we came to a detour. The detour lead us back to the interstate entrance. we ended up going back to the detour road and riding through it. There wasn't anything happening as it was Sunday. We stayed on the 30 until we got to Wooster where we had a Subway lunch. After lunch we decided to go back into the country as we had been on the 30 for about 80 kms. We were "pulled over" shortly after Woster by a guy named Skip. He was just curious where we were going and where we had been. He was a New York City policeman 30 years ago and he was telling us about how NAFTA had destroyed the local economy. Apparently, there was a Rubbermaid factory in the area before NAFTA with 6500 jobs. After NAFTA the factory shut down and so did 50% of the local businesses. He also let us know that Canton is not anywhere we would like to spend time. He basically compared to to NYC 30 years ago. He also let us know that the local area is home to the largest Amish population in the states. 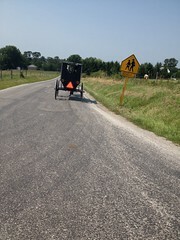 After we left Skip, we rode through Amish country and had some sighting including and horse drawn buggy with family. As we rode into Canton, it became visually clear what Skip had been talking about. 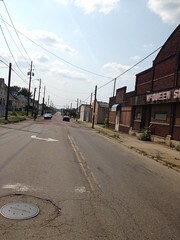 I haven't been as uncomfortable as I was today riding through the deserted streets of Canton. Abandoned burned out factories, houses and businesses. Newspapers blowing down the street and virtually no one anywhere. My main fear was that I would get a flat. Luckily I didn't. We stopped at a MCD's when I thought we were out of the "red zone" and we met Kristy and Micheal(?). They let us know that we should not stop in Canton. I'm not sure if they meant, don't stop for the night in a motel, or, don't stop, ever. They asked which way we rode came through town and when we told them they looked at each other with a "uh oh" kind of look. We got moving again and within 4km were riding through lovely community called Louisville. It's hard to understand how two communities that are so close in proximity can be so very different economically. Onto Alliance OH. 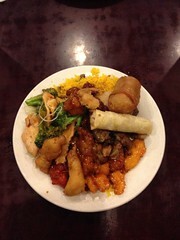 We found a great motel and went for a Chinese buffet. This was the 3rd day of consecutive headwinds that we had to contend with. Today's was not quite as bad s yesterday's but still a hindrance. Skip says Canton is no good. What he said! I didn't take a picture of their faces as I thought it was disrespectful. Anyone that knows me knows I would not want that. This couple were out for a day ride. 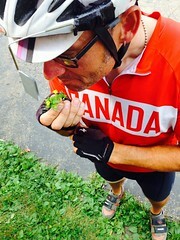 Smelling the flowers in Canton. Cobbled red brick streets in Canton. These nice folks told us to steer clear of Canton. Done. 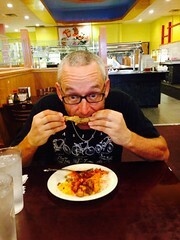 Eating frogs legs. What now? !